The Sparky Framework is WordPress theme framework created by HotThemes. It helps WordPress users in development of themes without programming skills, through an easy-to-use drag and drop interface. Sparky will help you to work faster, but it won’t take your FREEDOM to make themes that look anyhow you like! Use drag and drop technology to make your new layout in less than a minute! Sparky’s Layout Builder is where you create layout for your new website in few simple steps. Click “Add Row” button to make some rows. All widget positions and special elements are represented as cells. Drag some of them into the rows. Remove cells from the rows by dragging them back to the container of the widget positions. Sparky is different from other frameworks because it doesn’t limit you in any way. It’s based on 12 columns grid, but you can select width of your website according to your needs. You can also select gutter size (margins between cells) as well as padding of the cells. This grid can also be flexible, if you are working on a website that has a fluid width (100% width). Sparky also doesn’t have a predefined layout like many other frameworks. Using the Layout Builder, you can create your own layout according to your design in less than a minute. This brings you freedom, but doesn’t make things too complicated. If you use Sparky, your website won’t look similar as all other Sparky users’ websites. Sparky can follow your design guidelines in full. CSS has hundreds of commands, so don’t expect that you can control everything without writing the CSS stylesheets manually. However, if you need to edit the most common properties (such as color, font-size…) of the most common tags (such as H1, H2, H3, H4, p…), you can do it entirely through the Sparky’s Style Designer. Website’s background is something that you’d probably need to define. Sparky allows you to pick a solid background color as well as background image. If you are about to use an image, several parameters such as repeating and centering can be controlled through the Style Designer. With Sparky, you can create responsive websites. But you can also disable this feature. As the percent of the mobile Internet users grows, you should consider making your website mobile friendly. Sparky is responsive, but this feature can also be disabled, if you want all users to see the identical version of your website. Sparky “knows” what menus your WordPress installation has. For each of them, you can assign various menu systems and then control the menu system’s parameters for this menu. Menus are collections of links used as a navigation throughout the website. Sparky helps you to make your navigation. It lists all the menus available in your WordPress site. For each menu, you can select whether to control its appearance through Sparky or not. 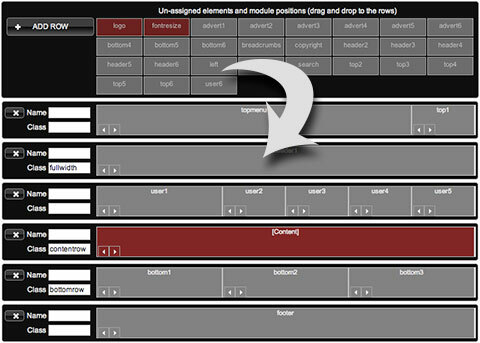 It’s possible to select several menu types, such as drop-down, classic, accordion and horizontal menu. Each of those menu types has its own settings, so you can control everything under the Menus tab. Another interesting option regarding the menus is under the Responsive tab. If you have drop-down menu in your site, Sparky can convert it into the select-box for mobile users (if it can’t fit the screen size). A handful of some interesting and useful features that you might need. Sparky doesn’t need any supporting extensions. Install theme and you have Sparky Framework 100% ready! This is a collection of “toys” for your site that you might (or might not) find useful. In some occasions, they can save a lot of time. Type your textual logo and slogan and control font’s appearance or select a logo image. 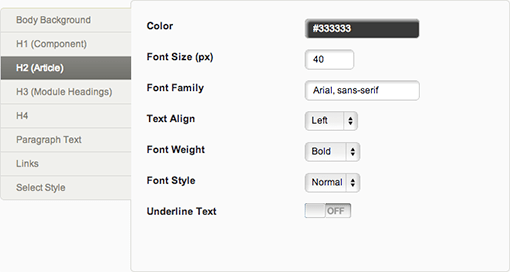 Font resize allows users to change font size on website. 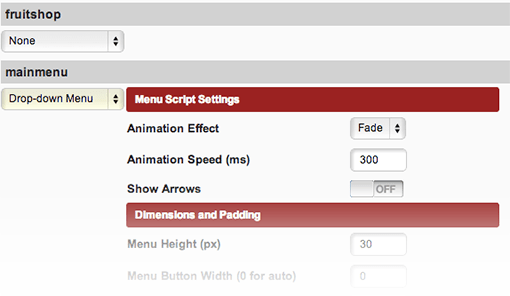 To enable this feature, drag “fontresize” box into any row in Layout Builder. Google Analytics can be activated just by entering your account’s id. Google Web Fonts tab is where you paste code snippets if you’d like to use specific non-standard fonts from Google. Sparky loads only the features that you really use, not everything. CSS code that’s dynamically generated has not been written on the page (inline). It’s loaded from the dynamically generated CSS file. This file doesn’t contain everything, but only the pieces of code that your site really uses. Another unique feature! 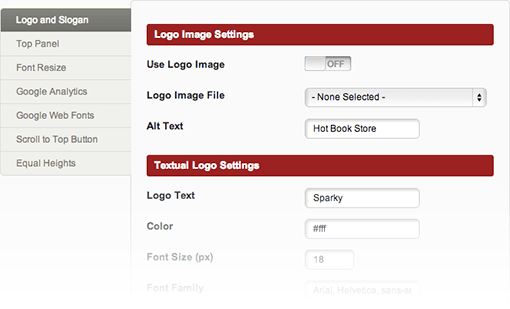 Just think out the name of your new theme… Sparky does the rest and creates the theme for you! You can name this theme however you like (per company or website name). This is the unique feature that only Sparky has! The Export tab has only one parameter. But, you’ll love it because it allows you to export your work into the new installable WordPress theme powered by Sparky, with all parameters and options kept. You’re just one click away from the new theme for your website or your client’s website. We prepared some online documentation and video tutorials that will guide you through the development of your website with Sparky. Everything will be covered, from the installation of Sparky to the export of your new theme. You will finish this series of tutorials with fully functional WordPress website. The main aim of these tutorials is to show off the most functions of Sparky to you. After you accomplish this fast course, you would be able to create your own websites. Please keep in mind, it’s assumed that you already understand WordPress and how it works, and that you have at least beginner knowledge of CSS.